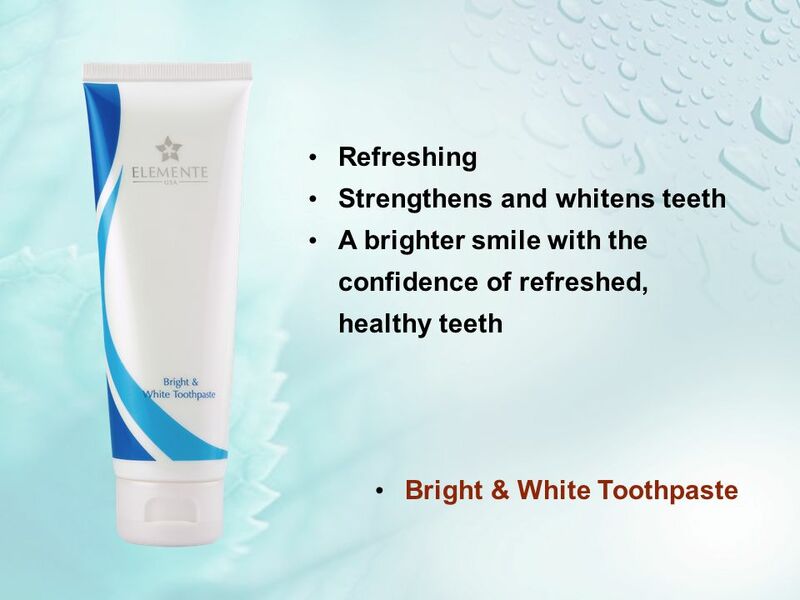 Refreshing Strengthens and whitens teeth A brighter smile with the confidence of refreshed, healthy teeth Bright & White Toothpaste. 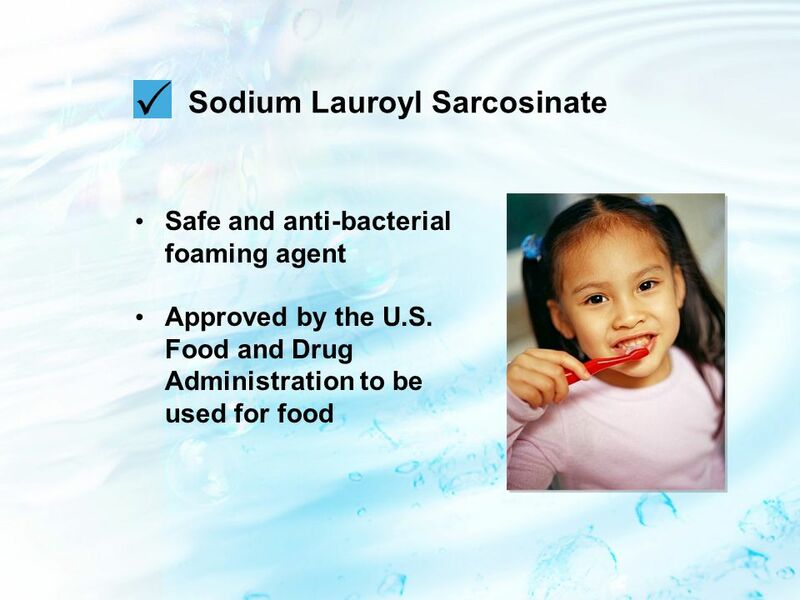 4 Triclosan Anti-bacterial Triclosan mixed with chlorinated water releases chloroform. 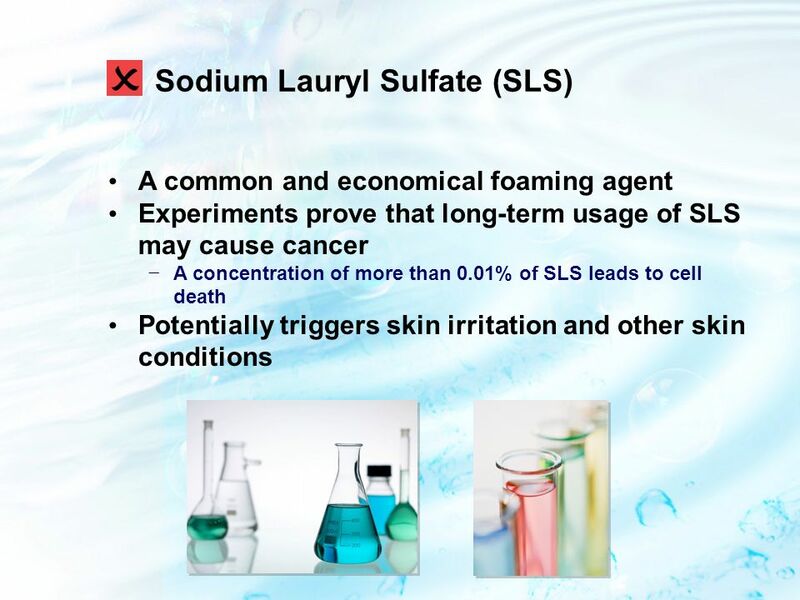 When absorbed through the skin, chloroform may cause depression, liver disorder and even cancer. 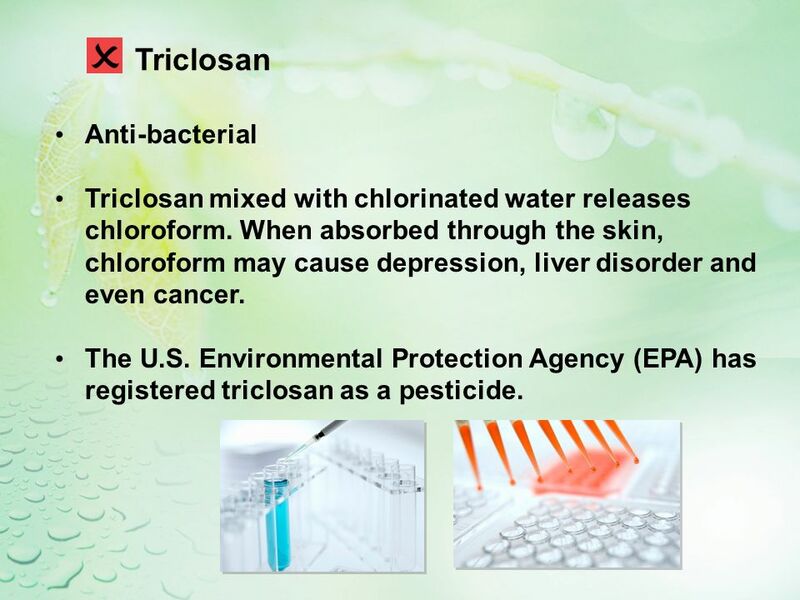 The U.S. Environmental Protection Agency (EPA) has registered triclosan as a pesticide. 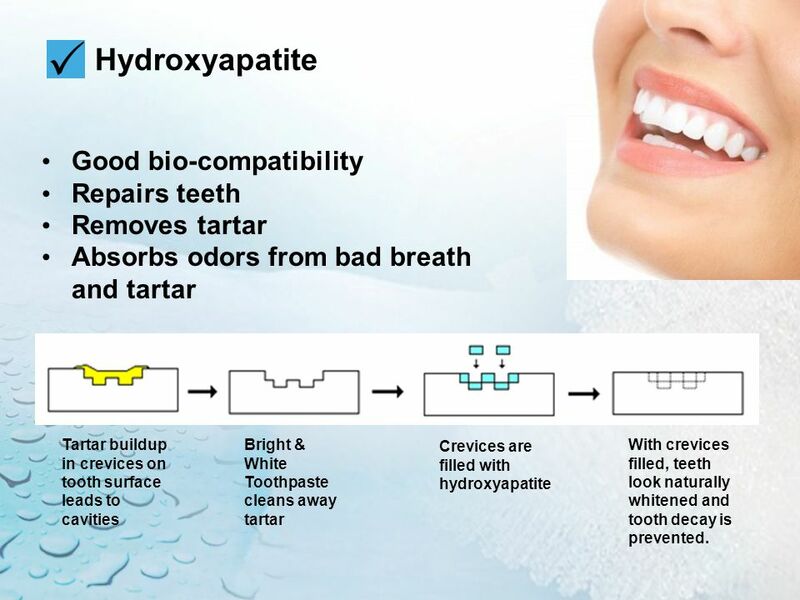 7 Hydroxyapatite Good bio-compatibility Repairs teeth Removes tartar Absorbs odors from bad breath and tartar Bright & White Toothpaste cleans away tartar Crevices are filled with hydroxyapatite Tartar buildup in crevices on tooth surface leads to cavities With crevices filled, teeth look naturally whitened and tooth decay is prevented. 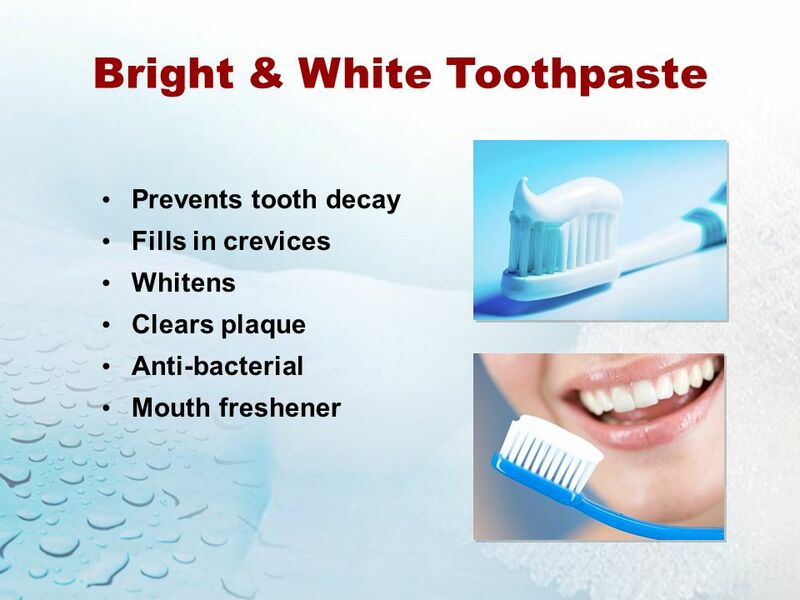 Download ppt "Refreshing Strengthens and whitens teeth A brighter smile with the confidence of refreshed, healthy teeth Bright & White Toothpaste." 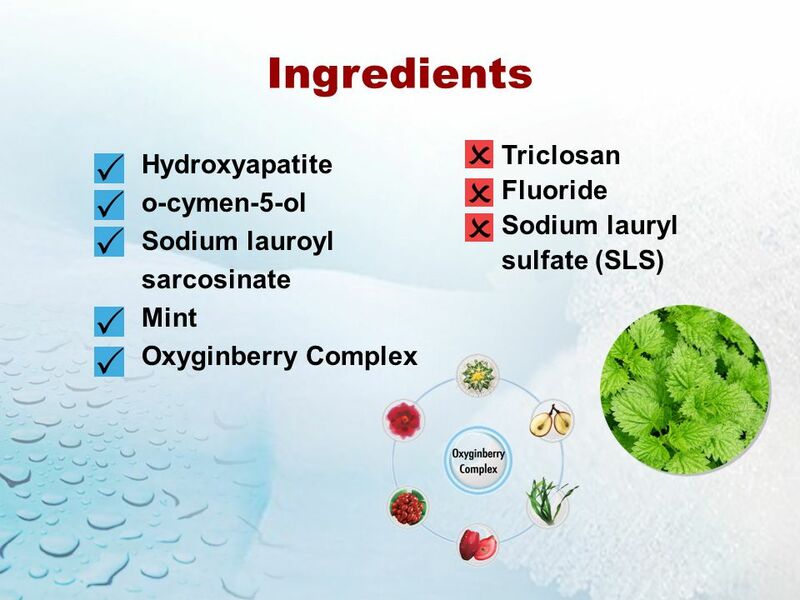 Care of Teeth and Mouth How can you keep your teeth healthy? Taking Care of your Teeth. 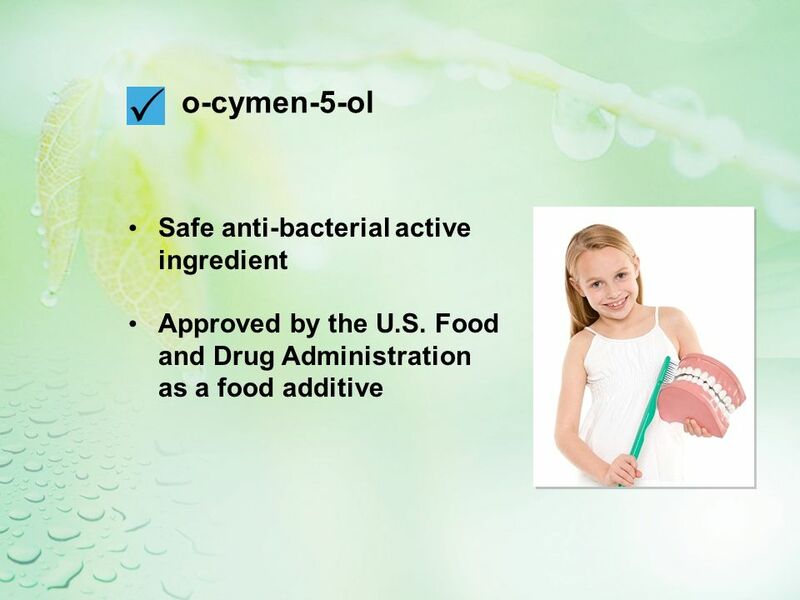 Statement of Objective Students will understand problems they may occur and ways to care for their teeth. The Teeth © PDST Home Economics. 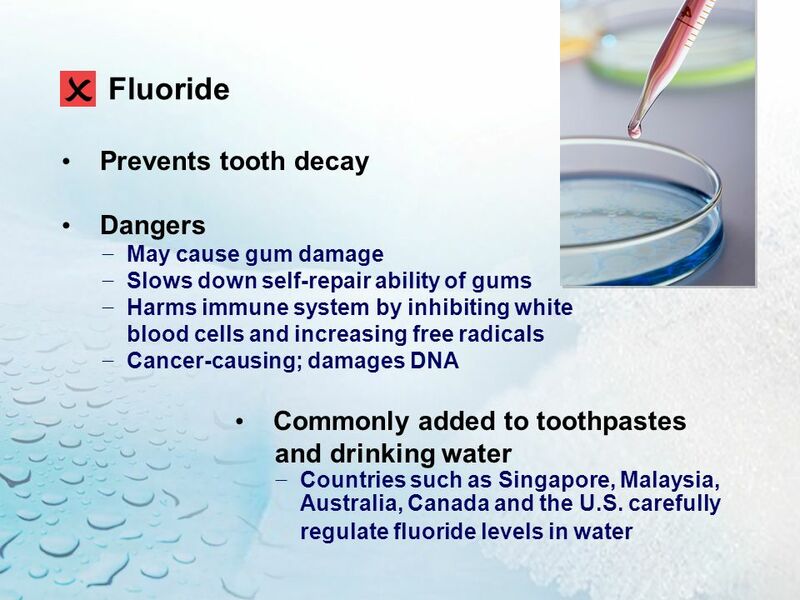 Healthy Teeth & Gums Help us to digest food Help us to digest food Make us look better Make us look better Good health. By Kyle. To keep your mouth healthy you need to look after your teeth and gums. To do this you must Dont eat sugary foods Eat healthy instead of sugary. Looking After Your Oral Health Oral Health Fact: Following these key strategies is the best way to prevent tooth decay and gum disease! Five key strategies. Toothpaste Lab Environmental Explorations Mr. Luis A. Velazquez. Dental Care A Web Quest. Brush Well: A Look at Dental Care Your teeth are important. Teeth help you smile, chew, and speak. Kids have 20 teeth. Adults have 32 teeth. Children’s. Testing Toothpaste Primary Science Enhancement Project. DENTIST – A HEALTH PRACTITIONER WHO TREATS AILMENTS OR ABNORMALITIES OF THE GUMS & TEETH AND TRIES TO PREVENT THEIR OCCURANCE. TRAINING: SIMILAR TO PHYSICIAN. Power point created by Janie Darby Pictures compiled from Bing Images. Rock Your Smile. Tooth Decay/Cavities  Definition: Cavities are permanently damaged areas in the hard surface of your teeth that develop into tiny openings.